The CN Tower , located in Downtown Toronto, Ontario, Canada, is a communications and observation tower standing 553.3 metres (1,815 ft) tall. It is the tallest free-standing structure in the Western Hemisphere, the signature icon of Toronto's skyline, and a symbol of Canada, attracting more than two million international visitors annually. At a height of 346m (1,136 ft.), the Look Out level offers breathtaking views and Horizons Restaurant . Also located on this level is one of many souvenir photo opportunities. One level down you will find not only the Glass Floor , but the Outdoor Observation level. Feel the breeze at 342m (1,122 ft.) above the ground. With a view 342m (1,122 ft.) straight down, even those not afraid of heights might need a little help on the clear Glass Floor . The Glass Floor has been specifically designed for you to have fun on it, walk on it, crawl across it, sit on it or even jump on it. Floor thickness: 2 ½ ". Located at the 447 metre (1465 ft.) level, 33 storeys above the main observation levels, the Sky Pod level offers you an awe-inspiring 360 degree unobstructed view of Toronto, Lake Ontario, and surrounding region. Visibility is over 160 kilometres (one hundred miles), and on a clear day it's not unusual to see Niagara Falls or Rochester, New York. A separate ticket is required. 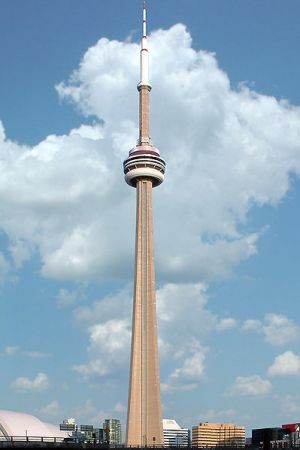 Tickets to Sky Pod are available at the base of the CN Tower or on the Look Out Level. A spectacular new state of the art high definition 3D theatre experience featuring The Ultimate Wave Tahiti 3D , the Toronto premiere of the first 3D surf film ever created. A separate ticket is required. Experience the thrill of this motion theatre ride, complete with special effects. A separate ticket is required. The Towers LED lighting system is designed to architecturally enhance the CN Tower structure from bottom to top, providing elegant night time illumination honouring the legacy of this national icon and landmark. Each night beginning at sunset the CN Tower features a standard lighting program in red and white, to honour Canada, with a short light show at the top of each hour. The Marketplace features 10,000 square feet of quality shopping. The Marketplace is among Toronto's most unique shopping experiences, a definite Toronto landmark. Such merchandise as authentic Canadiana, First Nations art and crafts, sport merchandise and unique travel and CN Tower souvenir items. One of Toronto's finest restaurants, features unforgettable food combined with a magnificent revolving view of Toronto more than 351 metres (1,151 ft) below. Lunch: 11:00am - 2:00pm; Dinner (Sunday-Thursday): 4:30pm - 10:30pm; Dinner (Friday & Saturday): 4:30pm - 11:00pm. Reservations are recommended by calling 416-362-5411. Located on the Look Out Level, the restaurant offers upscale bistro fare coupled with a spectacular view of the city below. Reservations are not required. Caters to a wide array of tastes, providing a delicious range of reasonably priced fresh market fare and beverages ideal for visitors and those on the go. Located in the base of the CN Tower. The CN Tower is open 364 days a year (closed on Christmas Day). Hours of Operation are generally 9 a.m. to 10 p.m., but are adjusted seasonally. Ticket Rates vary depending upon what attractions you want to see and your age. Passenger drop off is located at the CN Tower's sounth entrance on Bremner Boulevard. You'll find plenty of parking all around the CN Tower. The closest lot is the south lot of the Metro Toronto Convention Centre (enter off Lower Simcoe from Bremner Blvd or Lakeshore Blvd). Front St. West & John St.
"301 Front St West, Toronto, Ontario"
Above photo of CN Tower by Bill Wrigley from wikipedia.org.